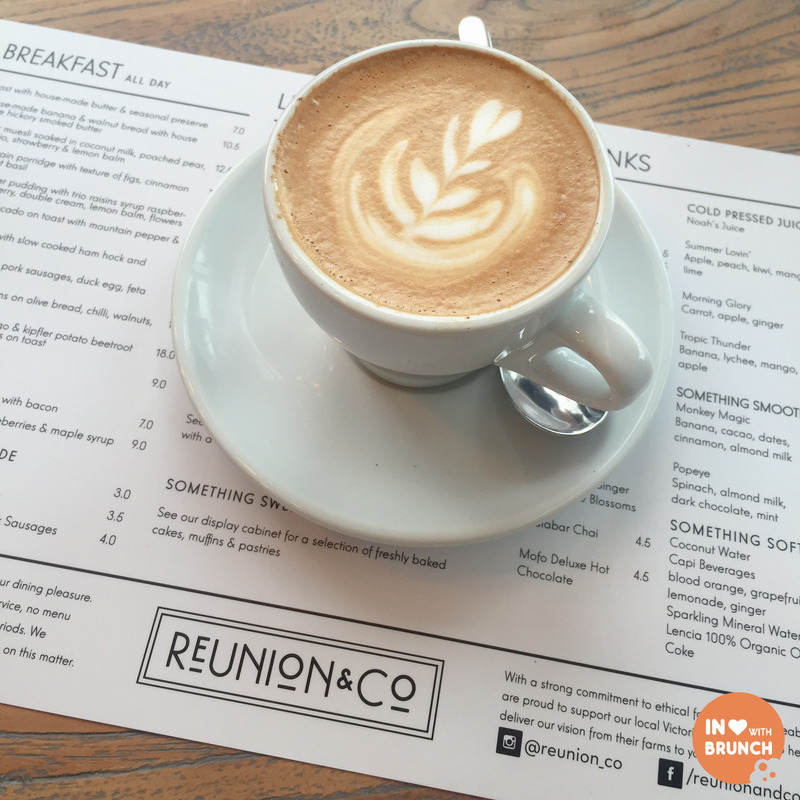 reunion and co opened on iconic bridge road, richmond only 2 weeks ago. 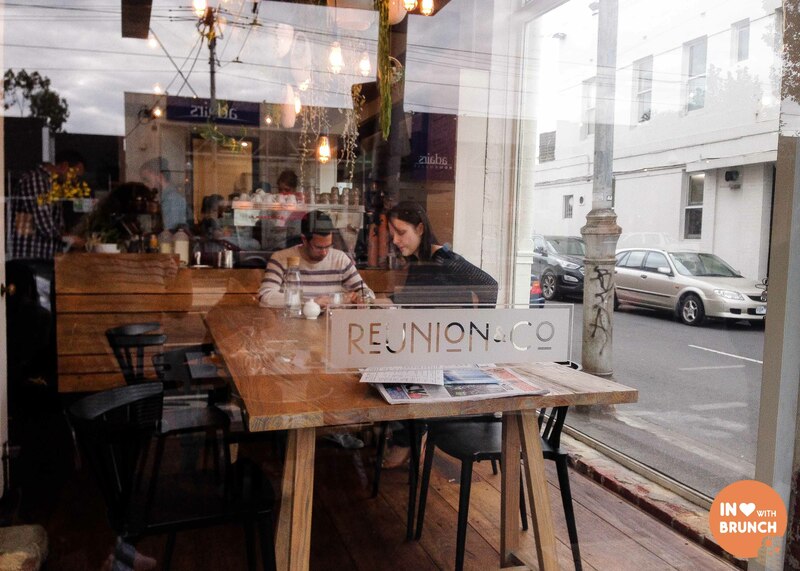 with a favourable north aspect, directly opposite some beautiful homewares stores + a short stroll to the richmond farmers market – it was an ideal location for a reunion of our own – with some friends we hadn’t seen in a while! my dish of choice for the morning + i was pretty stoked! fresh crispy toast, layered with your grandma’s best ham (yum yum yum! 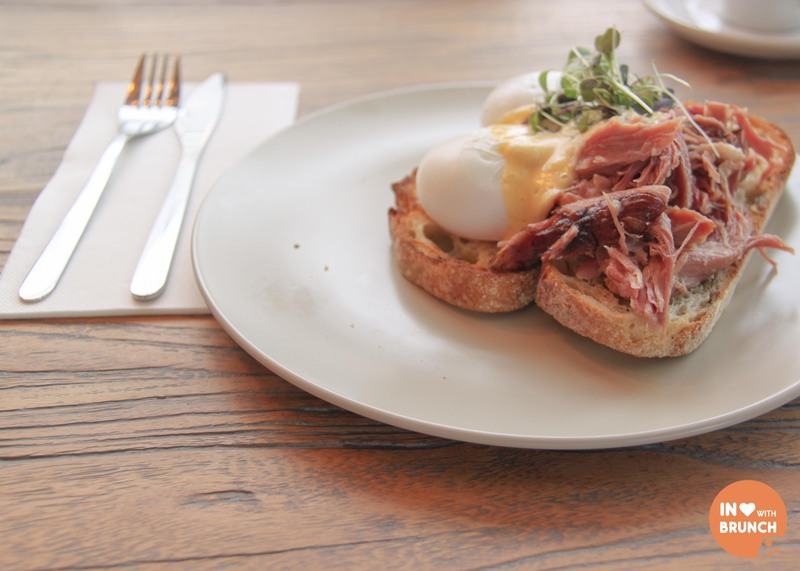 ), runny yolky poached eggs and a light delicate hollandaise. 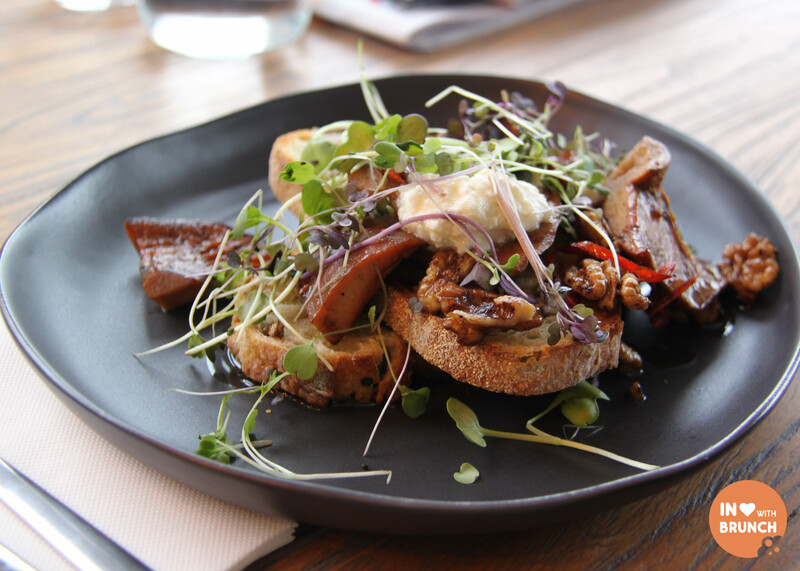 i was tossing up between ordering this and the eggs benedict, so thankfully when my friend decided to go for the mushrooms, i knew i was going to get a taste of both – yay! pretty as a picture, the mushrooms were divine and the walnuts added a beautiful nutty crunch. the dense olive bread paired perfectly, as did the tangy tartness of the goats curd. 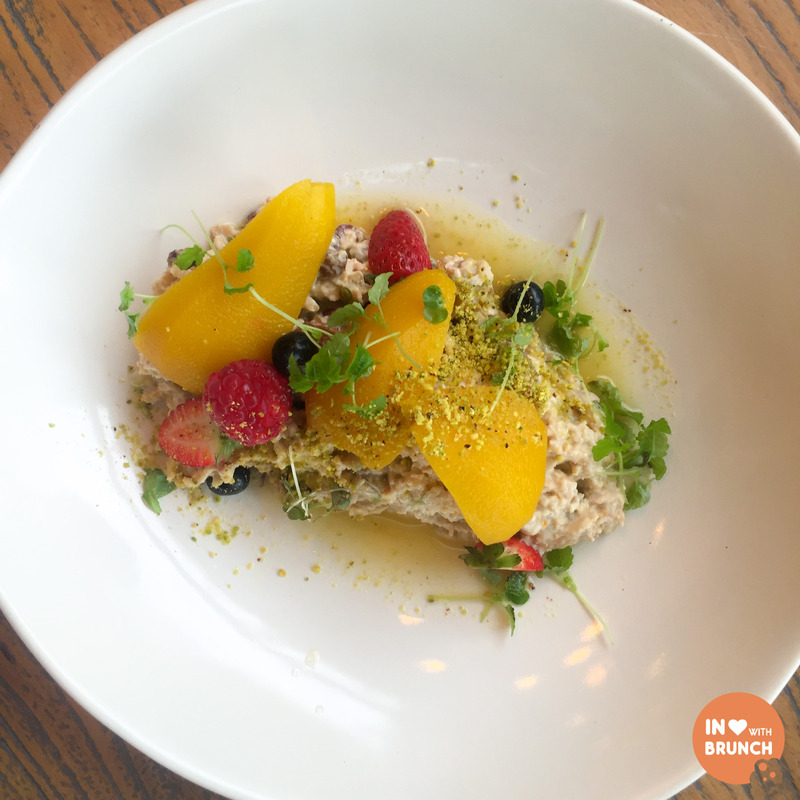 bircher muesli soaked in coconut milk, poached pear, pistachio, strawberry + lemon balm. when reading the menu, i was surprised that this didn’t come with a serve of yoghurt, however by my husband’s summation of the creamy coconuty muesli it didn’t need it anyway. and the poached and fresh fruits were unbelievably vibrant (that is not a filter on the photo) – delicious! scrambled eggs with bacon steak + heirloom tomato. 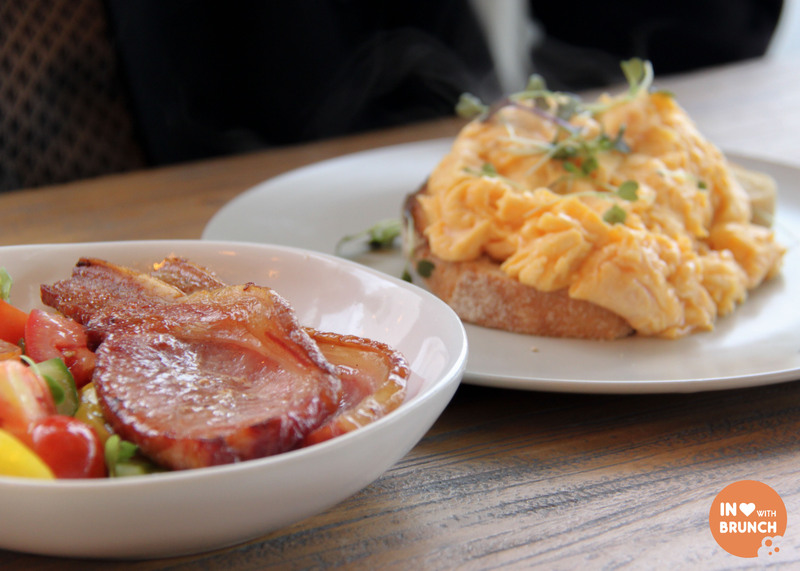 beautifully creamy scramble that looked pretty as a picture with the addition of microherbs on fresh crusty toast. the heirloom tomato salad, whilst not your typical roasted variety, was a beautiful and fresh breakfast accompaniment and the thick bacon steak was a winner with our friend. 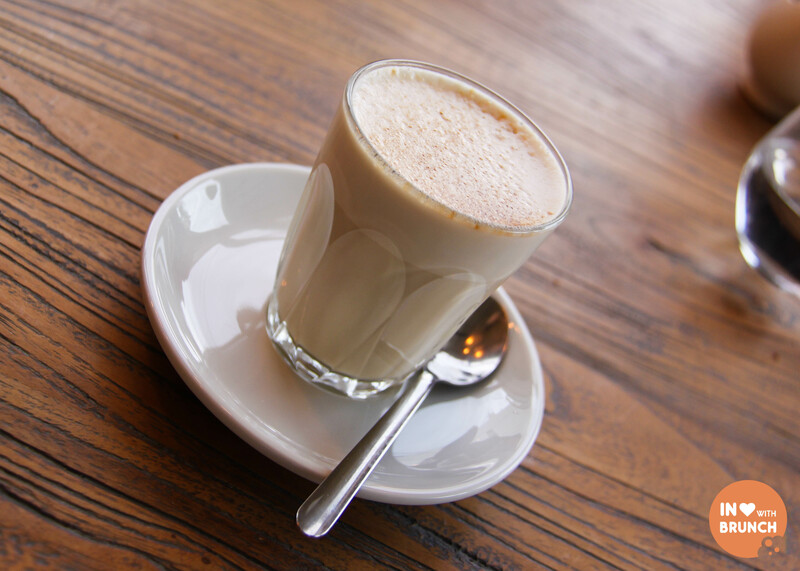 flat white made with allpress espresso, a slowly expanding but popular coffee roaster that started in new zealand in 1986, first making its way over to australia in 2000. from humble beginnings in a coffee cart in auckland, allpress is now also found in the uk and toyko. malabar chai i love cardamon and i love cinnamon, so when the two are combined into a creamy warm drink (and a little bit of ginger added), it’s always going to get my vote! the menu has a strong commitment to ethical farming and traceability which means they aim to support local victorian farmers as much as possible – and this was evident throughout our meal. however, i felt the service could’ve been a bit more “on”. staff were pleasant enough, but on more than one occasion our coffees and food were delivered (quite awkwardly) to the group at the other end of the large table we were seated at, and towards the end we felt a bit pushed to get out – i guess they probably thought we were just sitting around chatting when in fact we were waiting for a final coffee order which seemed to have been ‘forgotten’. in saying that, the interior layout is open and tables are generously spaced which means conversation levels are quite manageable. 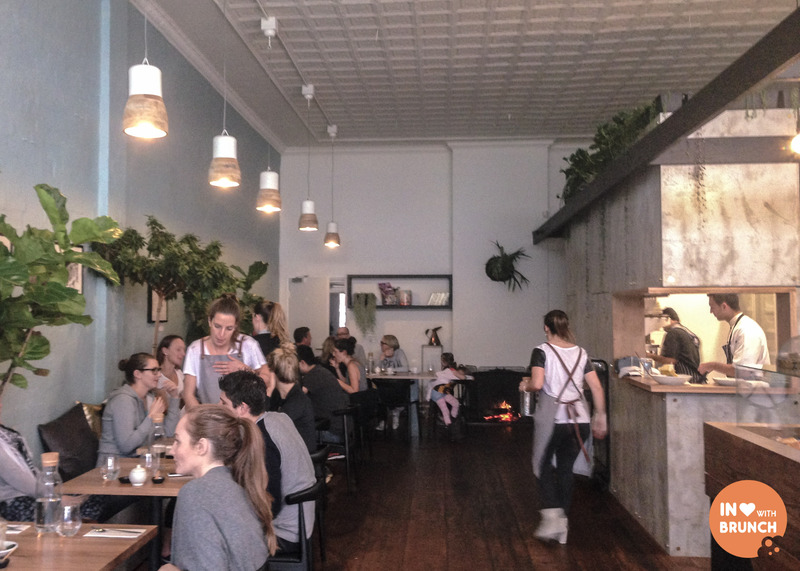 there is an abundance of real ferns and plants which I love, including really cool hanging vines from above the kitchen… the other HUGE plus is the gorgeous original fireplace on the back wall – a sure winner to keep diners cosy on those cold melbourne days! all in all the food was the stand out and we had a lovely morning, with just a few minor hiccups which the conversation and company certainly made up for! and if this is what they’re serving up 2 weeks in, i think its safe to say there will be plenty more reunion’s happening under that roof! verdict: until we meet again!